Everyone has it. It can creep up on you unexpectedly and it can stay for days, weeks, or months on end. It can be contagious and it can be induced by multiple causes, mainly by living a modern lifestyle. It can wreak havoc on your life and those around you, from family and friends to coworkers. We’re talking about stress. That annoying pain in your shoulders, neck, head, back, and everywhere that never seems to fully go away. Not everyone has patience for meditating, the will to take a sweaty gym class, the time for a therapeutic massage or the money to get psychologist-approved coping mechanisms. There is one strategy that has proven to be deeply effective and it’s one of the most popular sport and entertainment trends today. It doesn’t require any real fitness skill and it doesn’t require you to sit on a couch and spill your feelings about your career and relationship. All you need is a desire to experience fun in its purest form. Axe throwing is sweeping North America as not only an epic night out, but a way to relieve stress in an informal and relaxed environment. Taking a break from the computer screen to focus on a wooden target has many benefits—chief among them is the act of releasing pent-up aggression by physically throwing an object. It’s an old fashioned method that doesn’t involve breaking your priceless china or anything else you’ll regret later. In a completely safe and controlled group setting, you will literally and metaphorically throw away the stress of the day with each axe. Hurdling a steel blade through the air to hit a bullseye is extremely satisfying—even if you don’t exactly hit the target. There’s no pressure in this atmosphere, only friendly competition and encouraging words from friends and other teams around you. 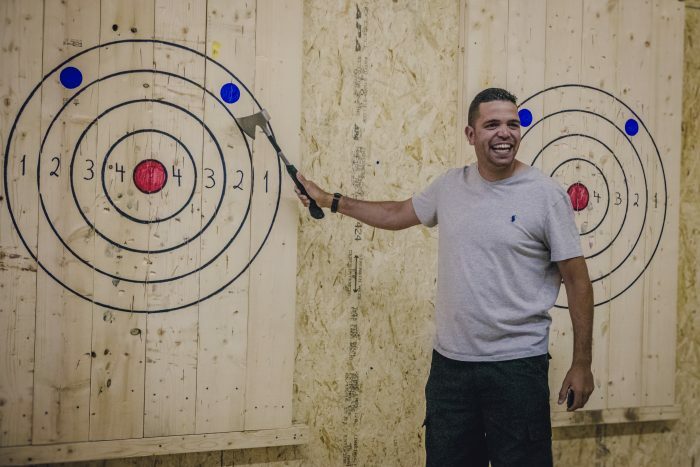 An axe throwing venue is the kind of positive and chill place where you can really let loose and be yourself. And if you do hit the target, you’ll feel a profound rush of excitement (and maybe even accomplishment)! If you haven’t done axe throwing before, you’ll likely discover an untapped talent or hobby you can enjoy with your favourite people. Perhaps you’ll even make your next birthday party an axe throwing one, or propose you forgo the awkward holiday office party for a team-building activity with axes. Axe throwing is also an inclusive sport that suits any age and any fitness level not to mention you can join The World Axe Throwing League and enjoy axe throwing every week. From the young and old to the fit and not-so-fit, it’s a physical activity that won’t strain your muscles. Each axe is about a pound in weight and engineered for easily handling. Under expert guides, you’ll learn the proper throwing technique as well as safety rules to keep you and those around you completely safe. Axe throwing is truly a fully body exercise, using your arms and legs to propel the axe in a fluid movement. It also uses your mind to concentrate on aiming for the target and strategically releasing the axe at the exact moment. The combination of body and mind provides an excellent way to relieve stress. While an uncommon method to melt (or throw) stress away, axe throwing is a physical activity that combines mental and emotional stimulation in a social setting where you’ll meet like-minded people. You can even join an axe throwing league to play regularly and meet new friends in a casual environment. 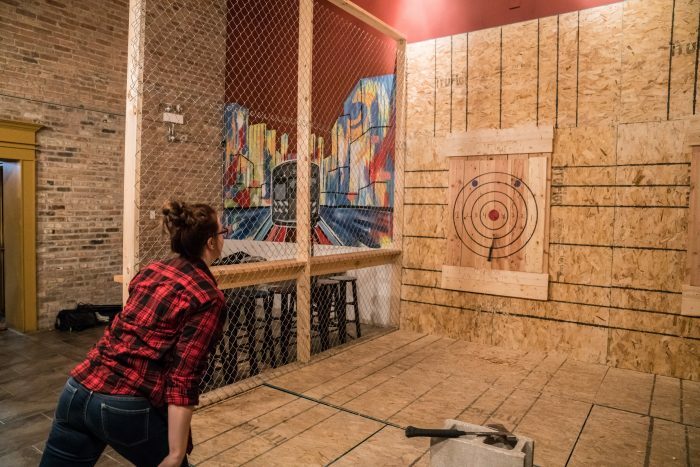 Friendly competition is encouraged at axe throwing games with round robin plays. There’s also room to mix things up by continuing to challenge your skill by throwing at different distances. Once more, axe throwing is affordable and a great idea to bring people together. No trendy workout clothes required. Relieve stress, try axe throwing with your friends. If you don’t have a group of 8 or more, you can always check out our public walk-in schedule. Ottawa Wraps Up The Winter 2017 Axe Throwing Leagues!